In 2002, University of Colorado Boulder graduate Aryn Schlichting moved to Vail with a group of 10 friends to do what ski bums do best: all play and no work. One by one, though, her pals moved to big cities in search of full-time jobs. Schlichting stayed. She landed a gig as an HR supervisor with Vail Resorts and—in 2015—founded mountaincareers.com, a job site aimed not just at the seasonal ski bum seeking temporary work but also midcareer professionals looking for roles as accountants and software developers. Schlichting’s career path may have sounded improbable 20 years ago, but nowadays, to her—and the 4,000 subscribers to her site—it’s as familiar as stepping into a pair of ski bindings. In the past, when the call of a full-time career fell on the ski bum’s frostbitten ears, it meant selling out and working a desk job in Denver. 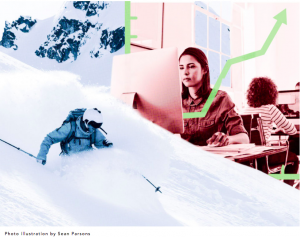 But recently, entrepreneurial ski bums have latched on to a nationwide trend: the remote office. By 2020, 43 percent of the American workforce is expected to work on a freelance or remote basis, according to a study by software developer Intuit. This September’s Denver Startup Week even hosted a panel discussion on the topic called “The New Ski Bum: Re-inventing The Future Of Mountain Towns Through Rec, Tech, And Innovation.” The key to making it all work? Co-working spaces. Sharing office space isn’t a new concept, of course, but if anyone’s used to pooling resources, it’s the ski bum, who wouldn’t blink at splitting a 900-square-foot apartment with four roommates. Sharing desks and business contacts, then, is no problem. Over the past five years, co-working hubs complete with skill-building workshops and networking events have sprung up in Summit, Eagle, and Pitkin counties. EVO3 Workspace in Frisco, which serves as the flagship location for CodeBeetle, offers coding workshops to aspiring developers. And this October, venture capitalist and Techstars co-founder Brad Feld invested $70,000 in Aspen Entrepreneurs (AE)—a co-working space that helps young entrepreneurs grow their ideas in the retail, hospitality, and service industries. AE co-founder Skippy Mesirow says that money will help AE guide more startups through its entrepreneur mentorship program. Mesirow himself stepped off the AE board in October to (hopefully) reclaim some ski days, but with startup projects flooding his inbox, that might be difficult. After all, he might be a ski bum, but when it comes to entrepreneurial work, Mesirow’s no slacker. ‣ Your happy place. A study published by National Geographic in October named Boulder the happiest city in the country. It’s also the eighth richest. Connection? ‣ What makes a legend. The Nuggets will retire late ’80s triple-double master Lafayette “Fat” Lever’s jersey during a ceremony on December 2. ‣ RTD’s New Year’s resolution to complete the N Line to Eastlake in 2019—instead of its original completion goal date in the first quarter of 2018. Thanks to construction, design, and approval delays, north metro Denverites will face another year of I-25 traffic.